Whether you're behind on the Battle for Zendikar storyline or just need a refresher, here's everything you need to know to follow the unfolding story of Oath of the Gatewatch when new stories resume on December 30. 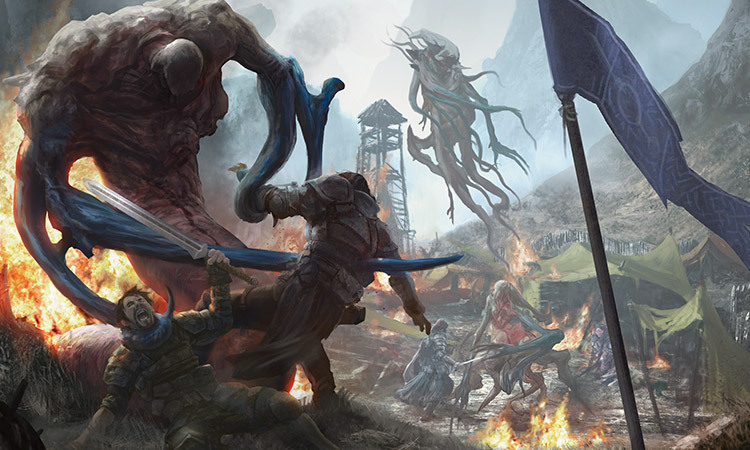 Missed any of these stories from Battle for Zendikar? Holding out to read them all at once? You can read any (or all) of the stories together in our newest Magic compilation! 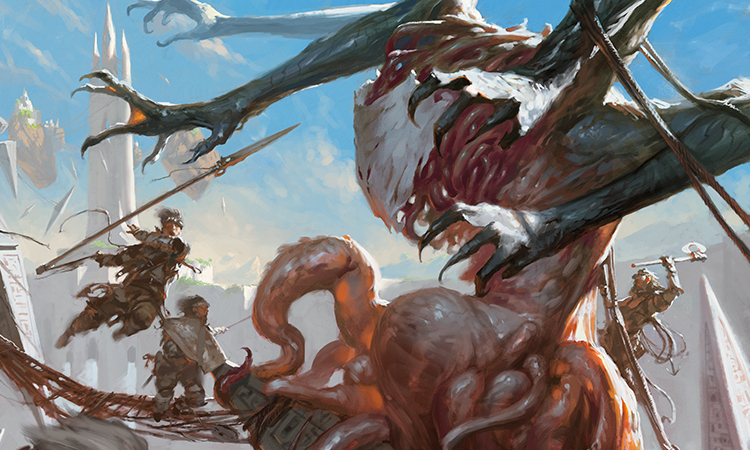 Catch up with your favorite characters on their adventures through the wilderness and their epic clashes with the Eldrazi. The stories are available in ePUB and mobi formats, which are compatible with most e-readers. You can also read all the stories on the web on the Battle for Zendikar story page and the Oath of the Gatewatch story page. The plane of Zendikar was once a tranquil world of mana-rich landscapes and magic-infused wilderness. Thousands of years ago, all that was nearly wiped out forever by the Eldrazi. 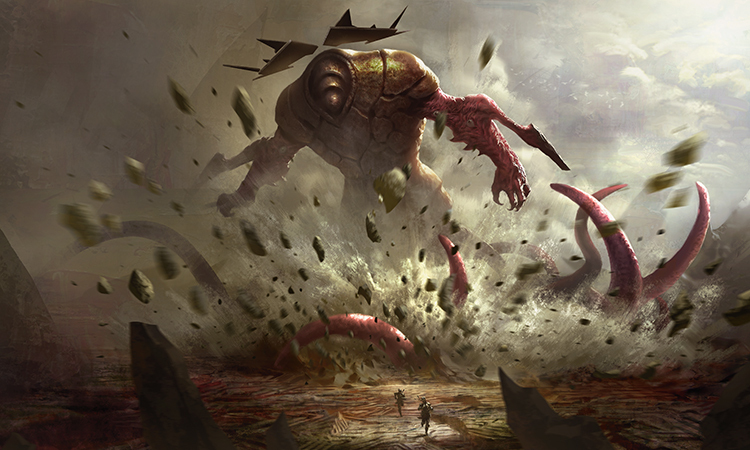 The Eldrazi titans are monstrous beings that roam the desolate spaces between worlds. They devour the mana and life energy of any plane they encounter before moving on to the next. Three ancient Planeswalkers—Ugin, the Spirit Dragon; Nahiri, the Lithomancer; and Sorin Markov—took action to stop those first Eldrazi. Although they couldn't kill the titans, they made a plan to imprison the astral abominations on Nahiri's home plane of Zendikar. At Ugin's direction, Nahiri constructed a massive network of stone structures called hedrons, whose power would form the bars of a worldwide prison. The Planeswalkers' trap worked. 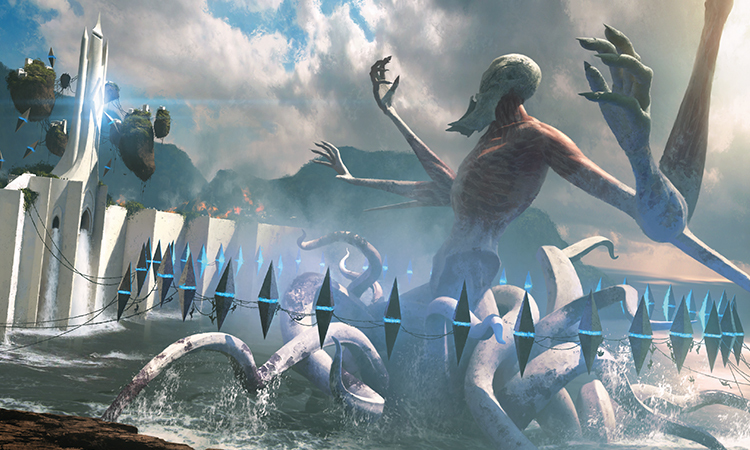 The Eldrazi titans, Emrakul, Ulamog, and Kozilek, manifested in physical form on Zendikar, where they became confined by the magic of the network of hedrons and sank into harmless dormancy. Sorin and Ugin left the plane, while Nahiri remained there to keep watch over the prison. 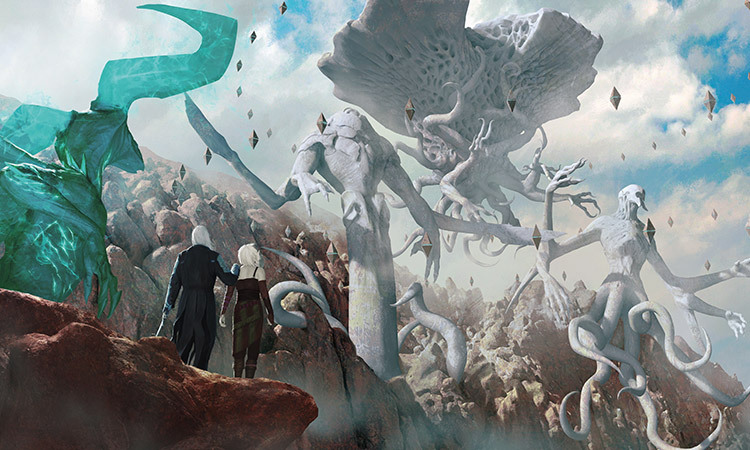 A little more than a thousand years ago, the Eldrazi nearly escaped—and neither Sorin nor Ugin returned to help. Nahiri restored the Eldrazi's prison on her own, then departed to check on her absent allies. She has not been seen since. The Eldrazi titans were imprisoned for thousands of years. Once—just once—they enjoyed the merest taste of freedom, and the result was cataclysmic. Nahiri disappeared after this first escape, going in search of the other two Planeswalkers who had abandoned her world and left her to deal with the Eldrazi alone. Even in her absence, the magic of the Eye of Ugin held fast. Then, for reasons of his own, the elder dragon Planeswalker Nicol Bolas arranged for three Planeswalkers to converge on the Eye and unknowingly reactivate it. These were his own mad minion Sarkhan Vol, the mind mage Jace Beleren, and the pyromancer Chandra Nalaar. The activation of the Eye loosed teeming broods of Eldrazi upon the plane, but the titans themselves were not yet free. Sorin Markov finally returned to Zendikar in an effort to prevent that from happening, enlisting the help of the Planeswalker Nissa Revane. Sorin led Nissa to the Eye with the intent of sealing it once more, as Nahiri had done the first time the bonds were loosened. But Nissa had other ideas. She believed that, given their freedom, the Eldrazi would leave Zendikar and wreak their destruction on other planes, thus making her home safe again. Instead of sealing the three titans tightly into their prison once more, she broke the last bonds holding them in, and the titans emerged into the world. After so many eons in stasis, the titans were not able to leave Zendikar immediately. They needed to feed, gather strength, and restore themselves. They followed their broods, spreading out across the plane, destroying large sections of land before starting to target the settlements where survivors had taken shelter. It was then that Gideon Jura first arrived on Zendikar, after following Chandra's trail to the plane in hopes of assisting her in the notoriously dangerous landscape. But by the time he arrived, Chandra was nowhere to be found, and Gideon became embroiled in attempting to protect the innocents of the plane as the Eldrazi carnage swept across Zendikar. After valiant attempts to defend the Zendikari against the titans' spawn, Gideon came face to face with one of the Eldrazi titans themselves. It was then that Gideon realized that he was unable to withstand this new threat alone. He needed reinforcements. Vowing to return, he left in search of aid at the center of Planeswalker activity: the city-world of Ravnica. Leaderless and hounded by inscrutable enemies, the resilient Zendikari kept moving across the dangerous plane, searching for safe places where they could regroup and try to reclaim their world. In Ravnica, Gideon successfully recruited the help of the city's Living Guildpact himself, the mind-mage Planeswalker Jace Beleren, though he was unable to secure the assistance of Liliana Vess or Chandra Nalaar. 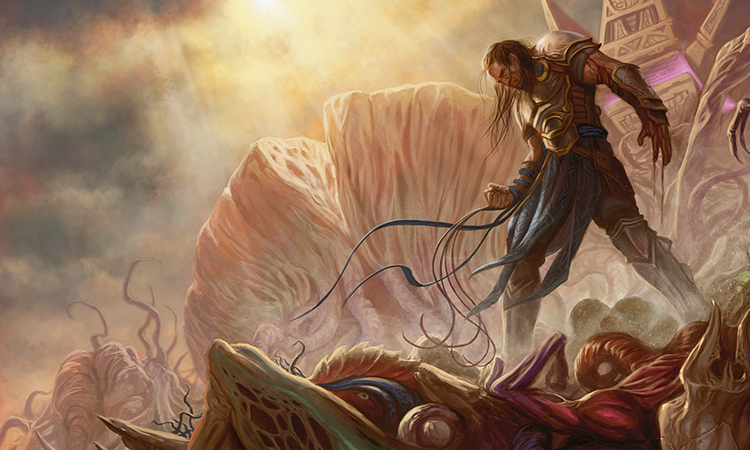 Together, Gideon and Jace returned to Zendikar to face the threat of the Eldrazi. Gideon and Jace arrived near the city of Sea Gate on Tazeem to a disastrous scene—the safe refuge of the Zendikari overtaken and filled with the bodies of its fallen defenders. Though they were too late to defend the refuge, the two were able to hold off the Eldrazi to allow survivors to flee to safety. 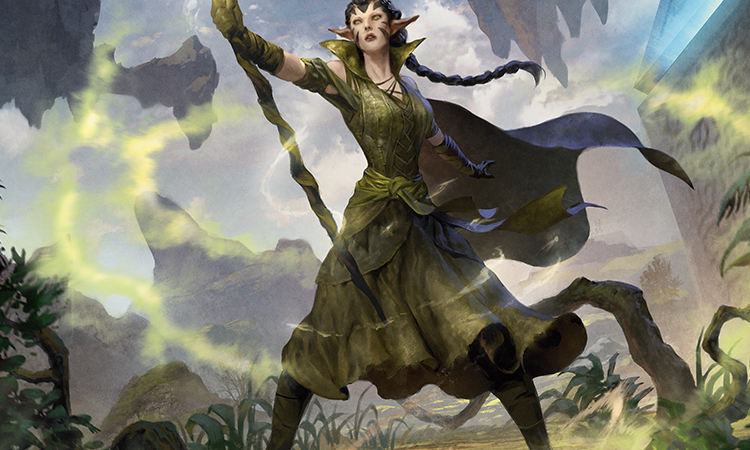 Among the survivors of Sea Gate was the Joraga elf Nissa Revane, a fellow Planeswalker who had dedicated her life to defending Zendikar from the Eldrazi. A master of elemental magic, Nissa draws considerable power from the soul of plane itself. But her connection to Zendikar's elemental soul had suddenly vanished—and with it, her ability to defend her home. Although their paths would take them in different directions, they agreed to meet outside Sea Gate to face the Eldrazi once more. Led by visions, Nissa traveled into the depths of the devastated continent of Bala Ged to find the Khalni Heart, an outgrowth of the soul of Zendikar. Through it, she rekindled her connection to the plane, but she also ran afoul of the demon Ob Nixilis, a former Planeswalker who hoped to use the power of the Khalni Heart to reignite his spark. Flush with the elemental power of Zendikar, Nissa bested Ob Nixilis, removed the Khalni Heart to safety, and left the demon seething underground. Meanwhile, Jace Beleren embarked on a journey of his own to better understand the power of Zendikar's hedrons, the stone structures Nahiri built to harness the power of the plane's magical leylines. With the help of one of Sea Gate's foremost merfolk scholars, Jori En, Jace proceeded to find answers at the Eye of Ugin. Here Jace found the Spirit Dragon Ugin himself rebuilding the damaged underground chamber whose magic had once held the Eldrazi captive for thousands of years. 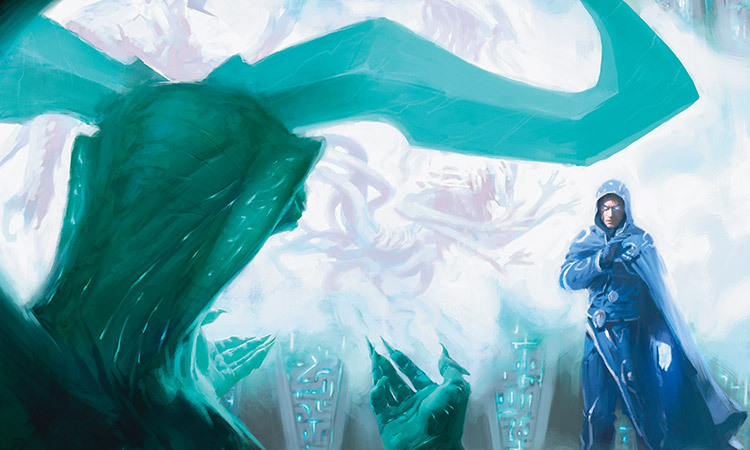 Ugin revealed to Jace how the network of stone "hedrons" might be used to again immobilize the Eldrazi titans, but Jace realized that the same trick might instead serve as a first step in killing them. Ignoring Ugin's dire warnings, Jace left the Eye and made his way to Sea Gate to pass this information on to Gideon. At Sea Gate, Gideon gathered an allied group of the Zendikari survivors. Battle-hardened veterans and desperate new recruits alike flocked to his banner: Drana and her legion of vampires, Noyan Dar and his roilmages, Tazri and her ground troops, the elven skyriders, goblins, kor, and Nissa with her force of elementals. They began an attack on the Eldrazi-controlled Sea Gate, with a timely appearance by Kiora, a merfolk Planeswalker native to Zendikar, who brought with her a weapon stolen from a god of Theros and a cadre of massive sea monsters. Together, their combined forces managed to wrest Sea Gate away from the Eldrazi invaders. As they savored their first moments of victory, the merfolk Jori En returned with dire news—the Eldrazi titan Ulamog himself was headed towards Sea Gate. In the face of this impending threat, Gideon and the allied Zendikari decided to stand and defend the city. Sea Gate's defensive ramparts were rebuilt and fortified, and Jace returned from the Eye of Ugin with a plan to entrap Ulamog using the hedron network with Nissa's assistance. Nissa and Jace raised and aligned hedrons into a ring that channeled the leylines of the Zendikar's energy. Gideon lured the titan into the center of the ring while the other two activated the network, imprisoning Ulamog. At the same time, the demon Ob Nixilis arrived, having followed Nissa from Bala Ged to Sea Gate. Here he encountered the welcome sight of a hedron network rife with Zendikar's elemental power. Seeing an opportunity to regain his long-lost power, Ob Nixilis knocked the hedrons out of alignment to siphon their energy and reignite his Planeswalker spark. Ob Nixilis was not the only late arrival. Across the Multiverse on the plane of Regatha, Chandra Nalaar was torn with regret over her decision to take on the position of Abbott of Keral Keep over joining Gideon and Jace in Zendikar. Unable to reconcile her passion for independence and adventure, she left the Keep for Zendikar...only to find Ob Nixilis disrupting the hedron network. Through all of this, Gideon and his allies still believed victory was attainable. Ulamog was still within the hedron ring, still in reach of Zendikar's army and Kiora's mighty followers. Gideon urged his soldiers forward, leaping to attack the titan himself. For a moment, Ulamog was battered, off balance, and apparently on the edge of defeat...but Ob Nixilis had called Kozilek, one of the other Eldrazi titans, from beneath Zendikar's surface. With two titans rampaging across the plane instead of one, the odds for Zendikar and its champions look worse than ever. The story will continue in Oath of the Gatewatch.